Topological insulators are new materials that have been studied by many research groups around the world for more than ten years. The main advantage of such materials is the presence (under certain symmetry conditions) of dissipationless states at the sample boundary, while the bulk material retains the properties of an insulator. In view of these properties, it is hoped that topological insulators can be used in advanced communications and information processing systems, as well as in quantum computing. Many properties of topological insulators have by now been well described theoretically, some of them have been verified experimentally. The basic properties that still require comprehensive verification include the shape of the energy dissipation curve of the edge states in a topological insulator, depending on their quasimomentum components. The law described by this curve underlies most of the observable and applied properties of the material, therefore it is very important to know its details. If, for example, we make a plot of the dissipation law for the electrons on the surface of the Bi2Te3 class compounds, it will resemble a flower with intricately shaped petals. The shape of the petals will contain information about the symmetry of the dissipation law, which directly affects the physical properties of the electron gas. Researchers at the UNN Faculty of Physics have long been engaged in the study of topological insulators. Recently, work has been completed on the impact of the dissipation law symmetry for electrons on the Bi2Te3 surface on the observed properties of this material. 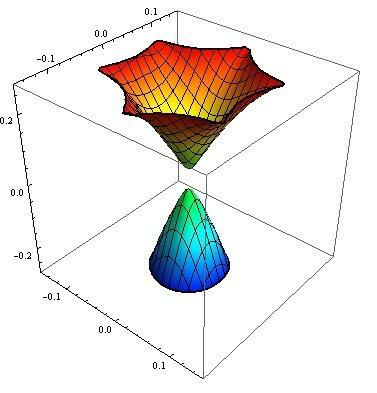 According to Associate Professor of the Department of Theoretical Physics Denis Khomitsky, researchers were able to show that the shape of the "petals" of the dissipation curve, or rather their symmetry, is a reflection of specific and measurable regularities. These regularities include the appearance of new peaks in the absorption spectrum of electromagnetic radiation with different polarization, as well as qualitative differences in the dynamics of the wave packet that are manifested when hexagonal distortion or corrugation of the spectrum is taken into account. "With the results obtained, we will be able to estimate in our future optical and transport experiments the real contribution of this corrugation, that is, to describe more accurately the details of the "petal" shape of the dissipation law", Denis Khomitsky notes. The authors of the article published in April 2018 in the Journal of Experimental and Theoretical Physics hope that a better understanding of this law will contribute to accelerating the development of practically useful applications and devices based on this class of materials.